a set of 12 Petite Stockings. Giveaway information will be at the bottom of the post. I made the stockings from a variety of antique linens. This particular pair of stockings are made from an antique french linen sheet and the cuff is made from vintage mangle cloth. 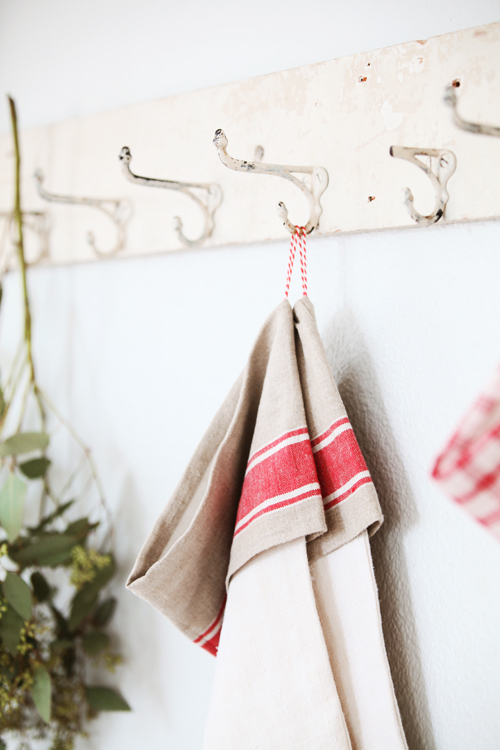 I love the red stripe on this mangle cloth. I also really like the contrast between the mangle cloth and the french linen. We used Vintage Dutch butcher twine for the loops on the stockings. My mom is here at the moment and hemmed all of my stockings for me. 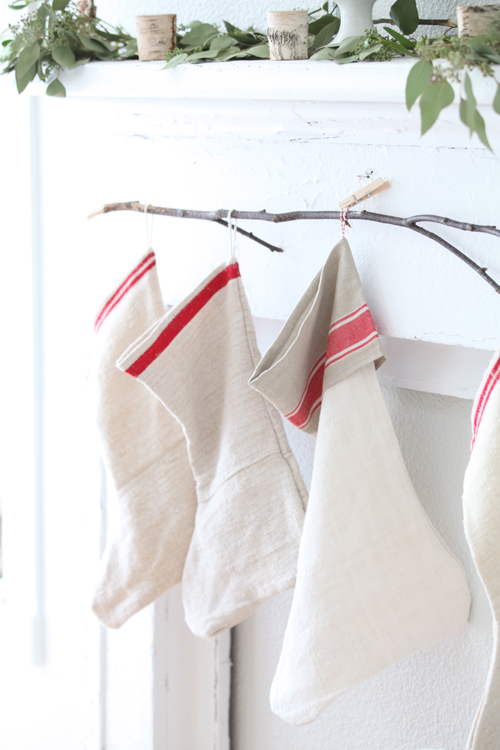 I made stockings from a variety of red striped Antique European Grain Sacks. I like how these four mismatched stockings look together. I recently found some duvets made from antique french textiles. 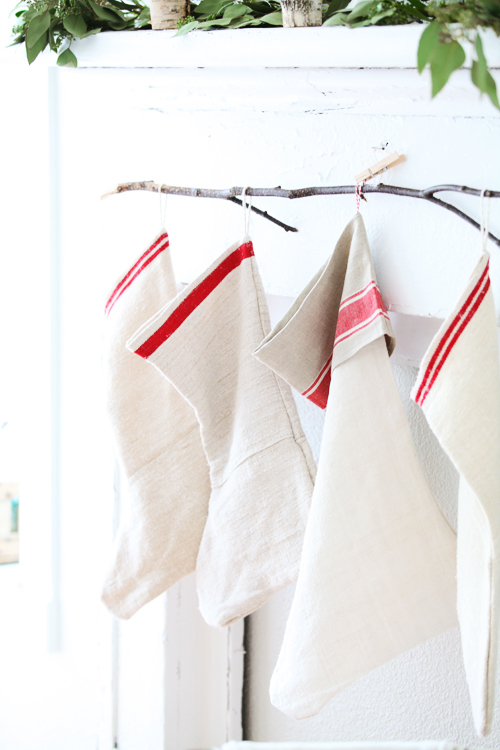 I added more petite stockings made from antique red striped European grain sacks to my shop as well. I will only be able to provide these little stockings for a limited time. They are easy to make however they do require a lot of time to make. Thank you to Jeff and Kelly Kansala of Wintersteen Farms you will get a chance to win a Wintersteen Farms wreath today along with two large stockings and a set of 12 petite stockings from my shop. Wintersteen Farms is a 36 acre noble and douglas fir tree farm. The wreaths are hand crafted from start to finish. Each Wreath is placed in their signature brown box after being packaged in a crystal clear bag, wrapped with tissue paper and tied off with a raffia ribbon. The material used to hand-craft their wreaths are cut daily to ensure freshness that will last throughout the season! 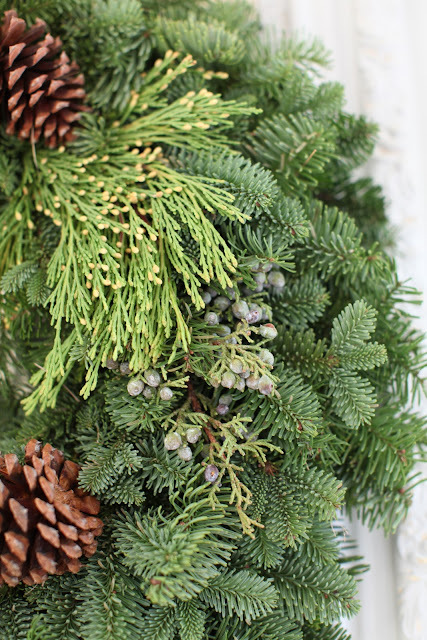 You can order your wreaths now by visiting Wintersteen Farms. 2. Two Large Stockings of your choice from my online shop. 3. 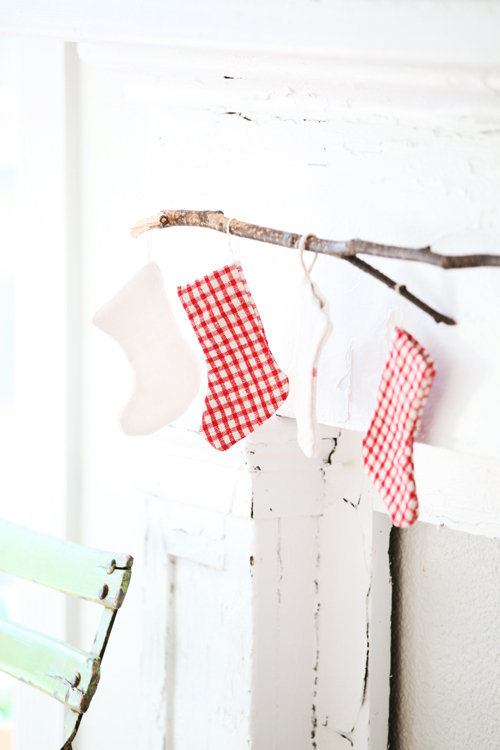 12 Petite red striped grain sack stockings also from my shop. Giveaway Ends December 7th at midnight. If you leave an anonymous comment, please make sure you also leave an email address. I hope you all get a chance to view Wintersteen Farms website. Their wreaths really make great Christmas Gifts too. You can pre-order your wreath and they will ship your wreath out November 28th. P.S. My husband and I currently are in Oklahoma City for a horse show. I also have lots of new items I will be listing in my shop next week. I would hang the wreath over the chimney. Thanks for these wonderful giveaways! I adore your Christmas' decorations! I love your creations and your home! I would hang it on the corner of the mirror gracing my entry. It would be the first thing people see when the enter the house. The tiny stockings are very cute. 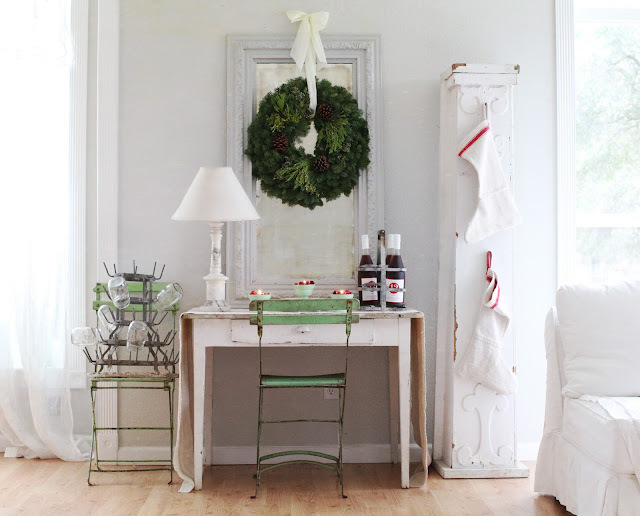 I would hang the wreath over an antique mirror in our dining room overlooking the Mandovi river in Goa, India. That's really the heart of our home and where our Christmas tree lives as well. Thanks for the giveaway! And that wreath just screams Christmas and snow. I would put it on the transoms over my doors in the livingroom. I would hang it right above our couch! Beautiful! Maria - Love your grain sack socks. So cute and natural looking. Hmmmm, I can smell that wreath already. Just bought a couple of vintage green shutters that are about 8' long that I will prop up against the wall. I think the wreath would hang perfect on them. Count me in. Just posted to my FB page for a second chance. I would hang it on my old hutch in my dining room. So beautiful! I would hang the beautiful wreath in my entry way to greet guests over the holidays. I would give the wreath to my husband's grandparents. It's been a long standing tradition for us to give them a fresh wreath for Christmas. Thanks for the chance. I would hang the wreath over the mirror in the foyer. I think it would be such a pretty addition! Thank you for this beautiful, generous giveaway! I would hang that wreath over a window in my dining room-the space is ready! I'd hang that on my living room wall, where I can smell it all day and evening. Adore the stockings, too! Thanks for the generous giveaway! I'd hang it on my diningroom wall it would be so nice to smell it thur the day! 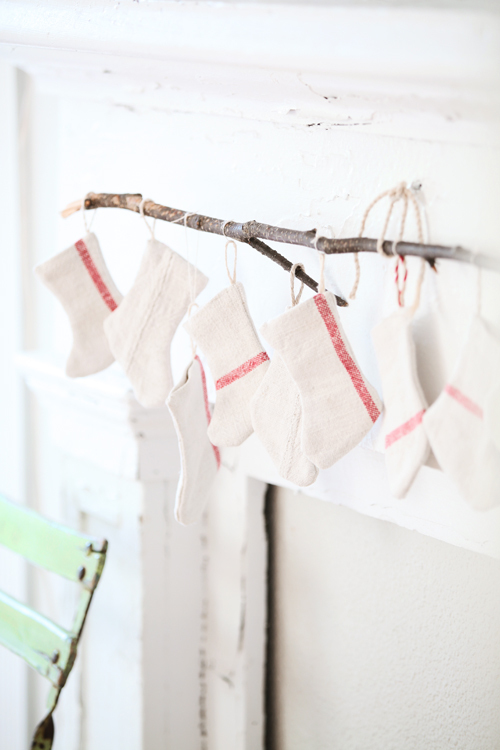 The little stockings are so cute those would definetly go on my mantel! I'd hang the wreath in the front door! Those wreaths are SO pretty:) I would love to win one. I would hang mine on my kitchen door. The smell of pine is Christmas to me! I'd hang the wreath in my front window for all to see and admire! Count me in please! Would love one of these wreaths for my new home! Signing papers mid-December, and we'll be in need of holiday spirit during the big move. Beautiful wreath! I would hang it on my kitchen window above my sink so I could enjoy it while baking Christmas goodies. 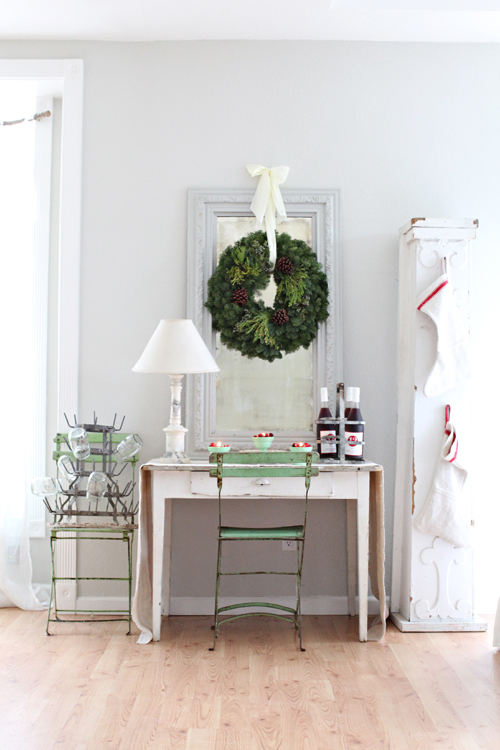 I love the idea of hanging a wreath (with pretty ribbon as the hanger) over a mirror. It feels like I get double the pleasure of the its prettiness. I would hang it on my front door so it greets everyone who comes to visit with its beauty and wonderful smells. What a beautiful and generous giveaway! Would love the chance to hang this wreath on my back window to see everytime I come into the house. I think I would hang our wreath in the mb...just for us to enjoy :) I love your stockings, I ordered a few petite ones yesterday! If I won the wreath I would hang it on an old cottage armoir that I have in the living room. Love your stockings...and the fact that each is different makes them even more sweeter. As for where I'd hang the wreath...I think it would look wonderful hanging over my mirror. Thanks for the chance! I would hang the wreath on a chair all by itself at my front door. I saw this once on a Real Simple Christmas issue and it was so beautiful. I really want those mini stockings to hang on the new old ladder I found at a barn sale. WOuldn't they look adorable. Thanks for the chance. This wreath would be lovely on my silver metal picture display shelf above my dining room table. I love the understated stockings, they would be perfect with any decor. First-your stockings are sooo darling! The little ones hanging from the tree branch are so darn cute! It would be hung over the entrance way console table. It is an inviting spot and all would see as they came into my home. The wreath would be hung on my interior french doors. I'd hang the Wingersteen Farms Wreath on the building where more people can see it. Wow!! What a great giveaway!!! I would hang the wreath in my entryway on a large mirror. I would hang the small stockings on a small tree in my entryway and the large stockings from my mantel!! I live in Oklahoma - about 20 miles from OKC. Hope you are enjoying your visit. You must see Bricktown - if you haven't already!!! Just shared your link on my fb page. Such an awesome giveaway!!! The wreath will be hung in my entryway on a large mirror. Thank you for hosting this great giveaway!! I hope you are enjoying Oklahoma!! such a lovely giveaway! i would hang the wreath on my front door! it would be the finishing touch to my just finished front porch! I won't have a cut tree for Christmas but a wreath would be so lovely and smell so wonderful. It would look gorgeous over the fire place. I love your petite stockings - so sweet. What a wonderful giveaway! I would love to hang them on my french doors! I am looking forward to your Christmas decorating pictures - you give us such inspiration! Love this giveaway and your beautiful blog. My front door is just waiting for this amazing wreath and my mantle so needs the stockings. what a great giveaway! love the stockings,and love the wreath,have the perfect spot for them!! I just love the chance to have one of those wreaths and the stockings. Gorgeous stockings, I love them! Thanks for the opportunity to win!! I would love these. My husband and I just moved into a new house and these would be PERFECT for decorating! They're just beautiful! To win this giveaway would make my holiday so much more special!!!!!! What a lovely Christmas Giveaway, please enter me I am a follower. I am also posting your Giveaway on my blog. You always have such amazing and generous giveaways! Crossing my fingers!! Would be wonderful to win this! Thanks for the opportunity! Tweeted this giveaway also.. Thanks again..
Blogged about this giveaway.. Thanks so much..
Oh, what a beautiful giveaway! I would surely hang it all around/over the fireplace! Thank you! Oh wow Maria....you are so generous!! I am sure it would make everyone's Christmas memorable to win this lovely giveaway! Thank you to both you and Wintersteen Farms!! We don't buy fresh trees anymore and I sure do miss the smell of fresh pine. I would use this beautiful wreath inside my home so I could enjoy it's aroma! thank you for this giveaway. please enter my name in the stocking. Merry Christmas! What a festive giveaway, thanks! Don't know if I can participate in this giveaway, since I live in Bruges (Belgium)... I'll just wait and see, right? What a great giveaway that of course I would love to win! Oh my goodness, another opportunity to win one of those lovely wreaths. And how sweet are the stockings. I still have the perfect spot for it all just waiting at my house. Just Precious! Love everything you do! what a generous giveaway! thank you soo much for the chance! Love the stockings you made! And the wreaths are gorgeous. so pretty--I would hang it above my fireplace. I posted this on fb. 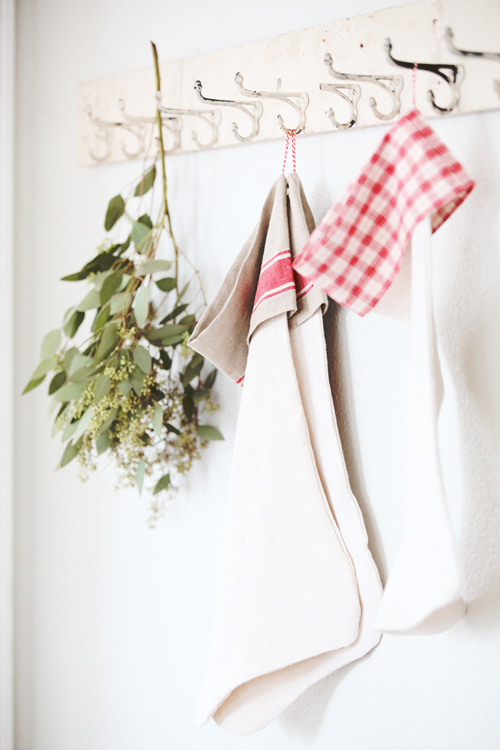 It would be a dream to win this giveaway :) I can almost smell that wreath in my home! I would be thrilled to win, wonderful and generous giveaway!! How nice of you to have another giveaway! I can't believe the holiday season is here already. I can always look forward to your blog for great decorating ideas. Thanks for the chance. I'm having a giveaway, too - books - come over! Put your button in my sidebar. Please count me in for a chance in your generous giveaway. Thank you! Oh please, may I win, oh please may I win!!! :-) Thanks for such an amazing giveaway, Maria. Lovelove your blog. Your spoiling us with your generous giveaways!! I love these stockings, they are just wonderful! Please add me to your giveaway. Hope you had a wonderful Thanksgiving and have fun at the horse show. I just added your giveaway to my blog sidebar. I just posted your giveaway on my Facebook page. there is nothing more welcoming than a fresh wreath, and the ones from wintersteen farms are absolutely full and gorgeous. i'd love to win one. thanks for the opportunity! Wow. What a Great Giveaway just in time for my out-of-town company! A lot can be forgiven in a room that has a fresh green wreath and such beautiful Christmas stockings. Lovely giveaway! Thanks so much.......:). Those stockings melt my insides! They would look lovely on my mantel! I love your blog! Love your style! So beautiful things! I think that I would cross stitch a name on each stocking. The wreath is lovely and natural. What a beautiful Christmas! I would so Love to win one of those wreaths. I would hang it on my living room door. And those stockings are gorgeous! I visited Wintersteen website. they have awesome stuff. These stocking are just beautiful and the wreath is lovely, perfect for this time of year. 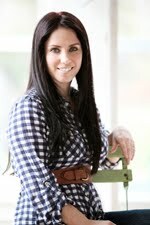 Maria you have the most amazingly stunning blog, I have enjoyed looking around at your lovely past posts so inspirational.I don't how I haven't followed you before however I am now,in hope that we can keep in touch. I know how busy you are but should you find a spare minute come and visit me one day and follow if you like, nice to find new friends. I hope you have a wonderful day. The wreath is beautiful and the stockings are just as lovely!! What a beautiful holiday giveaway! Gorgeous! Definitely sharing this post on my fb page Lovely giveaway! If I was the winner, I would hang this beauty on my front door! I always am happy when you write a new post. Thank you for having such a lovely giveaway. I would love to be entered in your drawing. My contact info is bwrawling at gmail.com. I adore you and your home! I'm an interior designer so this is right up my alley! The giveaway is great and I think it would be the perfect start to my new home! I am having a Give Away too, if your interested please stop by!! Wonderful ! What a lovely giveaway for the holidays! how beautiful! those stockings remind me of ones my mom enjoys making. These stockings are simply beautiful Maria. I thought I read that you didn't sew? ha, guess not! I adOre those teensy stockings! The wreaths are beautiful, too. I love your stockings! I am determined to make my own to mimic them. i soooo love your giveaways! whoever wins them is sure to enjoy them! thank you for the chance! dear maria... again, i have already won just looking at your darling stockings and the elegant wreath... thank you kindly for the season's invitation and joy! Those stockings are the cutest. Would love a fresh wreath and thanks for the chance. Love the stockings so much, they would look really spectacular in my all white, tiny studio cottage that my family is living in while our main house goes through a major remodel. We won't have room for a tree this year because of it, so it would be so great to win this giveaway for some festive holiday decor! The wreaths are gorgeous! What a merry giveaway! Thanks for a chance to win! Please enter me in this most generous giveaway! Posted it on my blog side bar! Posted on my FB page too! Beautiful, I can smell that wreath already...ahhh, nothing says Christmas like the smell of evergreens. Love your darling stockings too, simple perfection. What beautiful wreaths and stockings...thanks for the giveaway! Your Giveaways are always beyond amazing and so very generous... Loving these Grainsack Stockings! And those Wreaths... well, we just don't get 'em like that here in the Desert. I love your beauty and my home would love it too! Please count me in on your perfectly perfect GiveAway!! Love and blessings through the Holidays to you and yours. I have been follower for over a year now! and plan to follow for all that you inspire. I love this wreath and tried to go to the link to order as a gift. I couldnt access the link? Is it their website or my system. Can you pass this on or let me know? Help! Me again, nevermind i founf their shop on etsy. So excited! If its half a beautiful in person as in your pictures i will be thrilled! I would actually send the wreath to my brother. As a divorced dad, he's so so up on Christmas decor. I think he would enjoy the pick-me-up of a decorated front door. Guys just don;t do these things on their own. It's all gorgeous and completely charming, this is all I can say! The wreath is fabulous and I am in love with your stockings. Thanks so much for this wonderful giveaway. Lovely post. Thanks for opportunity to win. So very beautiful and so simple. Thanks for the inspiration! just left a post on my allthingswhite facebook page! I would love to win one of the wreaths and the the stockings are adorable! Those petite stockings are to diiiiiiiiiiiiie for!! ADORABLE!!! Happy holidays to everyone! These stockings are adorable and the wreath is beautiful. Merry christmas season to you! Love it all Maria!!! The wreath, the stockings.... HOpe you are having a great trip. Great giveaway.. And the little stockings are adorable! Wreath and stockings are absolutely gorgeous! What a wonderful Giveaway!!!! I hoop in right away! What a lovely giveaway! And I cannot believe you are here in Oklahoma for a horse show! May you and your Family have a Blessed Christmas Season! I pinned your giveaway on Pinterest too! I am now enjoying looking at your archives..your trip to Montana is amazing! I read and enjoy your blog, but I don't think I have ever commented before. The wreath would look great at my house! I love the stockings. You are very talented. Thank you. Beautiful giveaway, thanks for the opportunity! I love your giveaways - SO so generous AND useful. ...and BEAUTIFUL. Warmest wishes for the holidays! now onto FB. ...fingers crossed. FB...check. Officially decked out in merciless holiday giveaway re-posting. 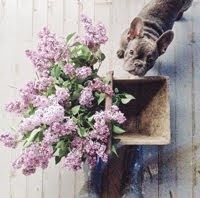 Loving your NY/anthropologie post. Wonderful photos! Beautiful! I would hang that wreath on the side of my porch next to the window. What a generous giveaway! Thank you for giving the opportunity to win such lil pretties! Can't wait for the results. LUV them all. Such a fabulous giveaway!! Thanks!! Oh My!! How lovely!! What a generous giveaway. Good Luck everyone!! Hudsonbeebe@yahoo.com I would hang this beautiful wreath in my kitchen to enjoy all season. All of your creations are beautiful! What a great gift to win! Would love it! And best of all, since it is sooooo generous, there is enough to share and brighten someone else's day! Thanks for the opportunity! I love the stockings!They are totally awesome. I will have to pin them to Pinterest! :) The wreaths look so neat also!I would, of course, love to win! Your page is beautiful and so inspiring to be in the mood to decorate for Christmas. 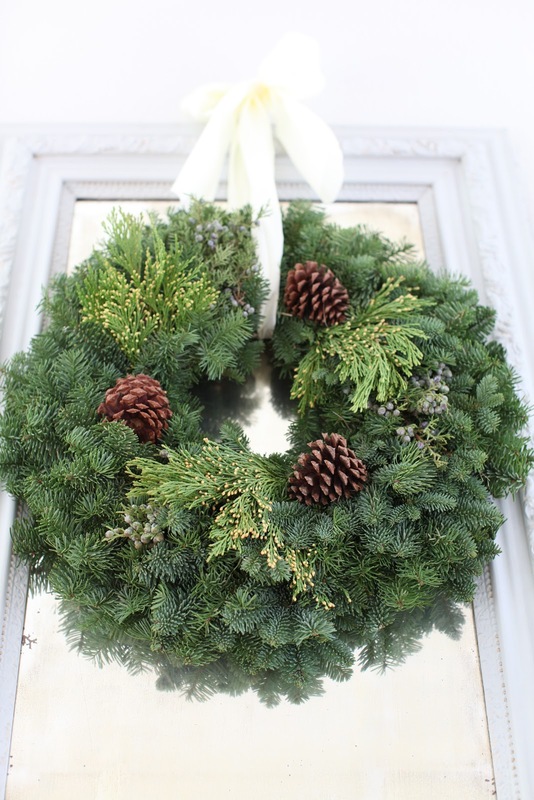 I would hang the lovely wreath on the french door we have going into our den so we could enjoy it all day long! The stockings are wonderful as well.I love the homespun look of them very much! Thank you for the giveaway! 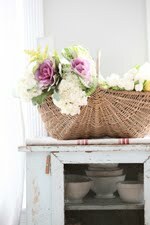 I always love coming over to your blog, I would love to have some of the things you decorate with. I am no longer physically able to get a real fir tree for Christmas so I would love to have the wreath to have that wonderful fur smell!! I so miss that!! Your stockings are great and of course would love to win them too! Thank you for this wonderful giveaway!! I love your blog and your beautiful hand work! I absolutely fell in love with your little stockings on the tree branch and I would display them the same in my home (no fireplace but I'll improvise). The wreath would hang in my entryway and I could see it from my living room and enjoy the smell of Christmas here in Texas. What WONDERFUL early Christmas gifts! I love them all! Maria, Thanks for another lovely giveaway-would love to win it! 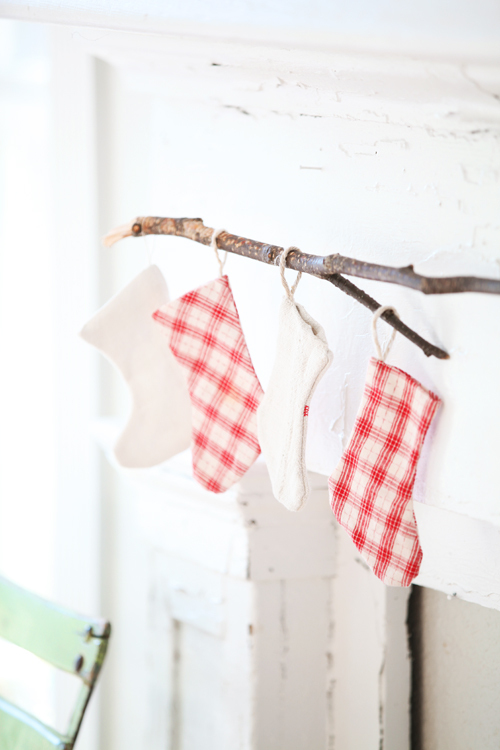 Got the little stockings and they are so perfect-so many ways to use them in making your home look cozy and Christmasy. Also the wreathes are amazing! Thanks for letting us know about them. Merry Christmas! A wreath this beautiful will make my home look oh so Christmassy! !would love to win! I just logged on to check out your Christmas decorations, expecting beauty and ideas. I love your stockings and am thrilled that I have a chance to win a wreath as well as some of your stockings! My email address is janfromwyoming AT bresnan DOT net.